It is quite likely that the vast majority of adults have experienced the phenomenon that is commonly referred to as ‘ringing in the ears’ at some time in their lives. In medical terms, this manifestation of sound is known as tinnitus, and in fact, the more common reference to ‘ringing’ is not entirely accurate, as the sound can take the form of hissing, buzzing, whistling, or roaring as well. For people with persistent or chronic tinnitus, there is an estimated 80 to 90% likelihood that they will also experience some degree of hearing loss. Nevertheless, due to any number of factors, many of these individuals might not be aware that their hearing has been impaired. 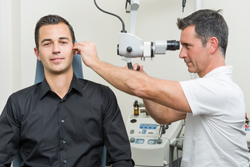 Therefore, whenever tinnitus symptoms are present, exclusive of their level of intensity and/or tolerability, it is highly advised that these individuals visit a local hearing centre to consult with a hearing loss specialist as soon as possible. By visiting a hearing centre such as Bravo Hearing Centre in Toronto, individuals who are experiencing chronic tinnitus can obtain professional insight on the potential causes of their symptoms as well as the appropriate support in addressing their specific situation. Although there is no cure for tinnitus, there are some treatment options that can help in reducing/minimizing the sound and/or the some of its contributing factors. For additional information on the full scope of tinnitus and hearing loss treatments and other hearing services available from the specialists at Bravo Hearing Centre, please visit our Hearing Services page. If you are experiencing persistent or chronic symptoms of tinnitus, a visit to our hearing clinic would be advisable to determine the causes and possible treatment options. Call the hearing loss specialists at Bravo Hearing Centre at 416-207-9711 to schedule your appointment today.